MONOSAN antibodies are developed both by MONOSAN laboratories in house and in collaboration with universities and research institutes throughout Europe, ensuring that all MONOSAN antibodies are extensively tested. Please use the search above to find antibodies to your specific marker protein using either the catalogue number or antigen name or simply use our contact form to ask us to search for you or request more information. Mouse anti Human Granzyme B, clone GrB-7 This antibody reacts with the 33 kD human serine protease granzyme B. It does not cross react with human granzyme A. It can be used as a marker for NK-cells and activated cytotoxic T-cells (CTL). This monoclonal antibody stains granzyme B expressing lymphocytes in sections of sublimate formaldehyde as well as formalin fixed paraffin embedded tissues. It does not react with other cell types. The antibody can not be used on frozen sections. The antibody is also useful for staining granzyme B protein on Western blots. Mouse anti Human Desmin, clone D33 This antibody is highly reactive with desmin and does not cross react with GFAP, Keratin, Vimentin or Neurofilament. This antibody stains muscle cells in human tissues. 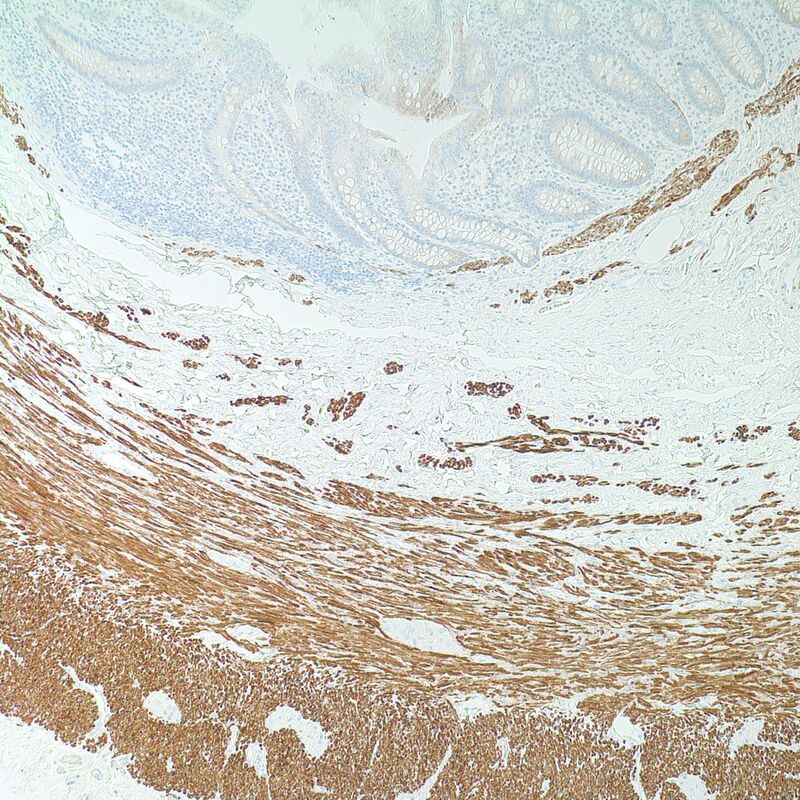 Frozen sections show excellent staining in immunohistochemistry or immunofluorescence. On sections of formalin fixed and paraffin embedded tissue the staining is reduced. This antibody is also useful in Western blots. Mouse anti CD56, Neural Cell Adhesion Molecule, NCAM, clone 123C3 This antibody recognizes a transmembrane glycoprotein of 140 and 180 kD which has been identified as NCAM (Neural Cell Adhesion Module). It reacts with epitope 2 of the two major epitopes which have been defined for NCAM. Thsi antibody is primarily used for the study of small cell carcinoma. Detection of CD56 positive lymphomas. At the international Workshop on SCLC antibodies this clone was categorised as cluster 1 antibody (Stahel et al 1994). Most importantly, Clone 123C3 can be used on routing formalin fixed paraffin sections after retrieval and it stains all cells in small cell carcinomas and carcinoids of the lung strongly positive. Neuroblastoma's, wilms tumors and adenoid cystic carcinomas of bronchial glands are also stained strongly positive. In non small lung cell carcinomas, clone 123C3 staining has been associated with more advanced stage and a decreased survival after surgery (Kibbelaar et al. 1991). 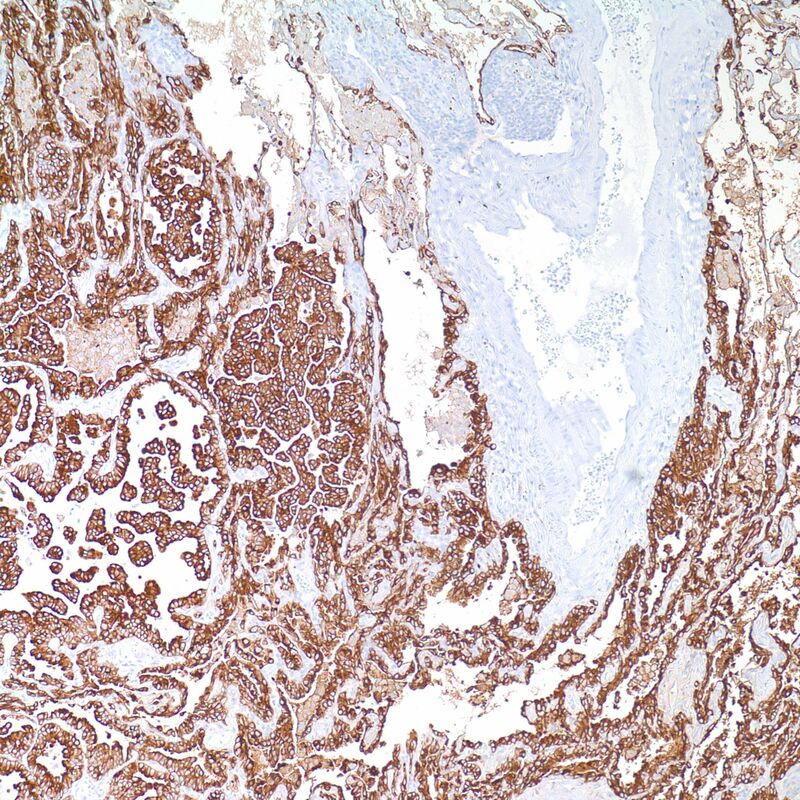 Positive staining with other tumors, include medullary thyroid carcinomas and some ovarian tumors. NCAM (CD56) is a marker for natural killer cells and clone 123C3 can be used to distinguish NK cells from other haematopoietic cell populations. Mouse anti Keratin 7, clone OVTL12/30 This antibody reacts specifically with Keratin 7. It stains a 54 kD protein band of cytoskeletal proteins from cell lines in one and two dimensional immuno blots. It cross reacts with human and mouse. 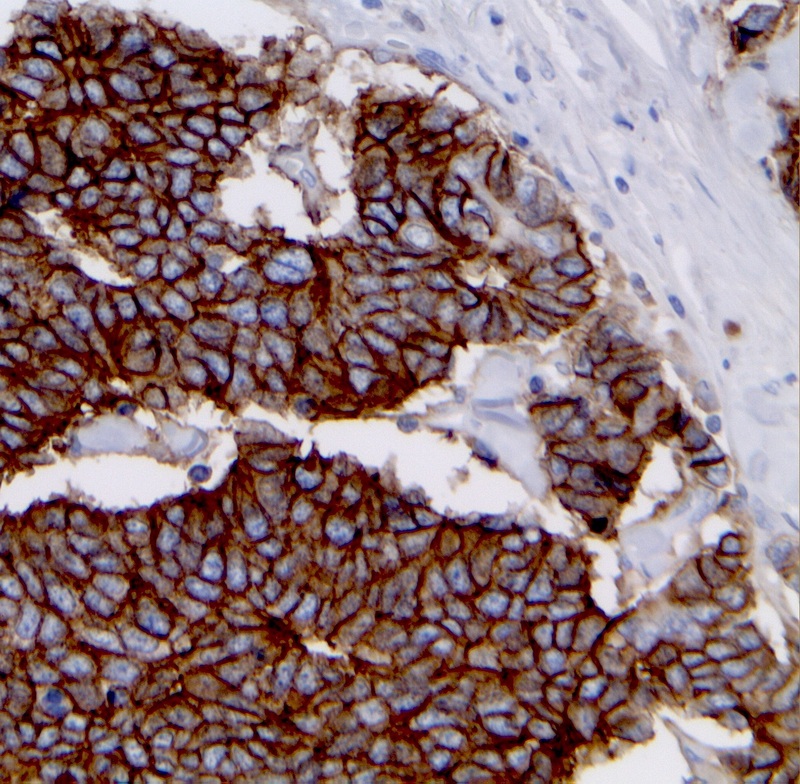 The antibody is a useful marker for histopathology and can be used to distinguish between ovarian carcinomas and colon carcinomas in paraffin embedded tissue sections. Mouse anti Eosinophil Major Basic Protein, clone BMK-13 This antibody binds to the 10 kD eosinophil Major Basic Protein (MBP) of both resting and activated eosinophils in cytospins and frozen sections of bronchial and skin biopsies of allergic sites and normal sites and thus can be used as a "pan - eosinophil" marker. It stains frozen sections of bronchial biopsies from atopic asthmatics, rhinitics and normal non-atopic subjects. It does not cross - react with any other human protein or cell. This mAb is a very useful tool for clinical and experimental allergy studies. Clone BMK-13 is a pan-eosinophil marker in both frozen sections and paraffin embedded tissues. Also this antibody can be used in specific ELISA tests to determine the release of MBP and to quantify the number of eosinophils in various in vitro adhesion assays. Tumour cell insensitivity to anticancer drugs frequently appears as multidrug resistance (MDR), associated with the overexpression of one or more of a set of at least 10 different molecules, causing reduced drug levels at the intracellular target sites. These overexpressed molecules include transmembrane transporter proteins such as P glycoprotein, MRP1-9 and BCRP. In addition, the lung-resistance protein, recently identified as the major vault protein, has also been associated with MDR. Our Monosan monoclonal antibodies specifically recognise these proteins and so can be used to help identify their roles in clinical drug resistance and explore their occurrence in normal human tissues and physiology. We highlight 4 of our Multi Drug Resistance Antibodies below, followed by a list all of the available antibodies in our Multi Drug Resistance range. Anti Breast Cancer Resistance Protein (ABCG2) Clone BXP-21. This monoclonal antibody reacts with an internal epitope of BCRP, a 70 kD transmembrane half-transporter which is involved in Multidrug resistance. BXP-21 did not cross-react with the human MDR1, MRP1or MRP2 gene products during testing. Anti MDR3 P-gp (ABCB4) Clone P3II-26. This monoclonal antibody reacts with an internal epitope of MDR3 P-gp (a fragment of MDR3 P-gp comprising amino acid 629 - 692). P3II-26 does not cross-react with human MDR1 P-gp. Anti MRP2 (ABCC2) Clone M2III-6. 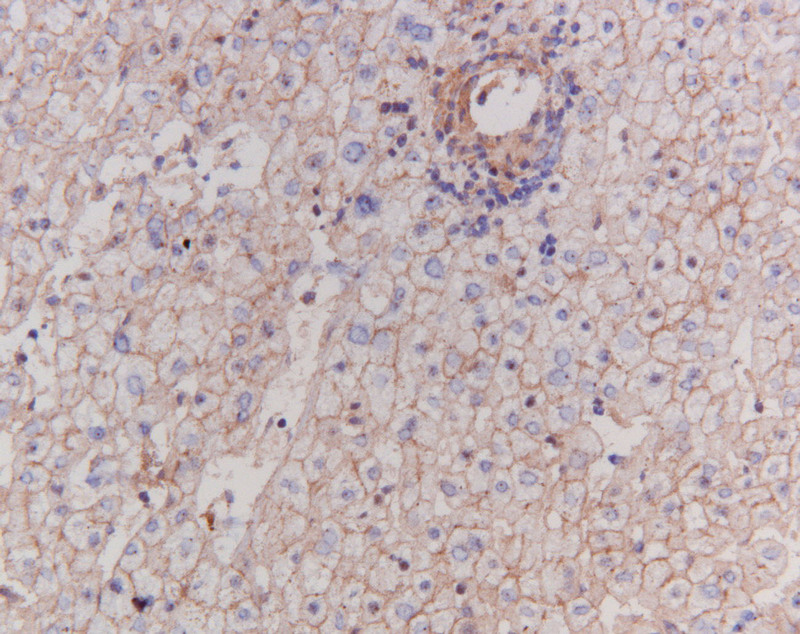 This monoclonal antibody reacts with an internal epitope of cMOAT/MRP2, a 170-180 kD transmembrane protein known as the canalicular multi-organic anion transporter, absent in patients with the Dubin-Johnson syndrome, an autosomal recessive liver disorder characterised by chronic conjugated hyperbilirubinemia. cMOAT/MRP2 is closely related to the multidrug resistance related protein MRP, and its overexpression has been observed in a subset of cisplatin resistant cell lines. Clone M2III-6 did not cross react with the human MDR1, MRP1, MRP3 and MRP5 gene products. Follow the links below for further details of the other Multi Drug Resistance Antibodies Available and datsheets. Or if you have any questions simply use our contact form and we'll be happy to help.